Life requires courage in so many unexpected and unheralded ways. Perhaps there was no better example of this than watching the videos of people in Boston running to help those hurt from the explosion at the Boston Marathon yesterday rather than running in the other direction. What propelled those folks to go toward the unknown at the possible risk to their own lives? And what is courage? The great writer Ernest Hemingway described courage as “grace under pressure”. Perhaps he romanticized the concept but indeed courage is a kind of strength or resolve that bubbles up within someone to meet a scary, and sometimes potentially fatal, challenge with a presence of mind to act in spite of fear. While we can certainly agree that those who went to help the injured in the explosion displayed courage by their selfless actions, courage is also a part of our daily lives. The folks in Boston simply showed what is innate inside of us; the common good we have for each other that is actually a part of our daily lives. In Boston it was brought to our attention in the most visible way. Some of us may think that courage is going to a terrible job with an equally horrible boss, or putting up with any number of bad situations. That’s simply mustering up the strength to cope until we either solve the problem or move on. What’s courageous is the laid off worker who maxes out his credit cards to follow his dream of starting his own small business to provide for his family or those who have the moral courage to speak out against injustice or the young man who rejects the pressure and allure of joining a gang and pursues an educational goal instead. 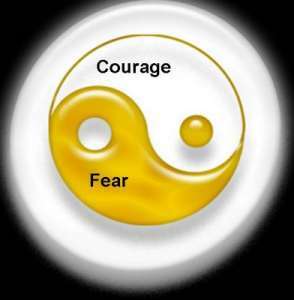 Courage then is an understanding that there are often no easy paths in our daily journey and that we are all flawed but stronger than we realize. Every day courage empowers us to stand up for what we believe, to do what is morally right, to pick ourselves up and try again, to not retreat from injustice, to love rather than hate, to move forward rather than regress, to create rather than destroy, to face whatever unresolved issues hamper our progress and to face the fact that no one gets out of this life alive. When we see people just like us do extraordinary acts in spite of the danger, it reaffirms our most basic of human trait and in that sense mindless violence has been defeated.